The Amazon River basin and its tributaries are clearly visible in this imagery from the Cyclone Global Navigation Satellite System. 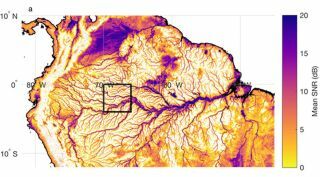 Clara Chew of the University Corporation for Atmospheric Research published in August Amazon River basin flood maps with observations from SMAP's radar and radiometer as well as CYGNSS. SMAP's radiometer offered 30-kilometer resolution and its radar three-kilometer resolution compared with roughly 500-meter resolution for CYGNSS. Two years into the mission, CYGNSS also is working well in its intended job: observing ocean winds at the core of tropical cyclones, Ruf said. Initially, CYGNSS data on high winds did not match observations made by the National Oceanic and Atmospheric Administration's hurricane-hunting airplanes. Since then, CYGNSS data products have been refined. CYGNSS' eight satellites spaced 12 minutes apart provided valuable measurements of winds associated with Typhoon Trami, which struck Japan in September. "With the frequency of sampling, we can do things like capture rapid intensification," Ruf said. On remaining challenge for CYGNSS program officials is correcting data produced by the satellite's Delay Doppler Mapping Instrument as a result of the variability in GPS signals. The U.S. government increases or decreases GPS signal strength in response to jamming. "We don't know beforehand," Ruf said. "We are developing real-time correction algorithms."